Concrete is a flooring material with unmatched versatility. You can customize it to meet your specific needs, whatever they are. From complete flooring systems that entirely redesign your concrete to simple polishing that brings out your concrete’s naturals beauty, a concrete floor can be redesigned in any number of ways. With concrete, you can get the truly custom floor you want in your home. One amazing decorative concrete flooring option is Metallic Marble Stains from Dukes Surface Solutions. 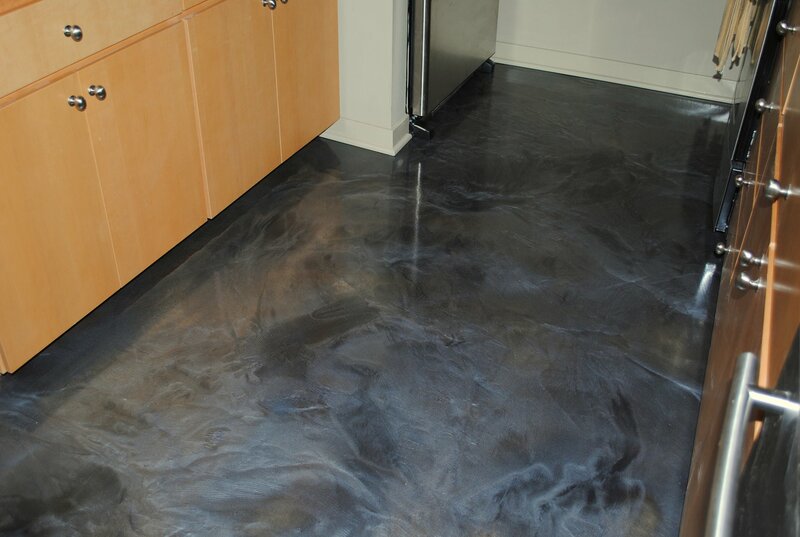 Metallic Marble Stains transform concrete floors and give them the look of real marble for a fraction of the price. These high quality stains combine the industrial strength of concrete with the decorative abilities of concrete staining. Metallic Marble Stains go far beyond regular concrete staining to create a three-dimensional look and design that you’ll definitely love. See a major difference in your floor with metallic floors from Dukes Surface Solutions. Metallic Marble Stains can have slip resistance and UV blockers added to give you a textured floor that won’t discolor. Your new floor will have a beautiful high-gloss finish with the additional option of a satin top-coat to create a floor that looks like natural marble floors with a beautiful, subdued color. For a beautiful, sophisticated, and durable floor, Metallic Marble Stains is a great option.